MURMANSK – The construction of the Bovanenkovo-Ukhta pipeline through the Komi Republic, south of Arkangelsk, has been hailed by Alexei Miller, chief of Russia’s natural gas monopoly Gazprom, as a “unique gas transport system of the new generation” – but its construction has been accompanied by grave violations of Russian legislation, and is leaving in its wake human victims and environmental chaos. Akin to mammoth building projects of the Soviet era, the project seems to involve as many bones, wastelands and crushed eco-systems as it does blueprints and girders. Given the project’s “national priority” however, there is little that can be done to dissuade the eye of the government from prospective progress with appeals for basic human and environmental justice when questions of gas markets in the west are at stake. The Bovanenkovo-Ukhta pipeline project could therefore be a harbinger of things to come – villages that have stood for hundreds of years wiped off the map by progress to be replaced by industrial trash heaps, local populations displaces and disregarded by non-local workers who turn their settlements into dumps – as the Shtokman oil and gas condensate field project, Russia’s main ‘priority’ industrial project, ramps up. Once again, the success of the Russian state is likely to be reckoned in cubic meters of gas pumped, “unique” industrial structures erected and money pumped into the ailing budget at the expense of the quality of human life – which, if the record of the project is any indication, is plummeting without any official notice or intervention. Conflict erupted between Bovanenkovo-Ukhta pipeline builders and state natural preservation department, environmental groups, regional parliamentarians, and even the project’s workers. The Bovanenkovo-Ukhta mainline pipe is estimated to be one of the most fundamental elements to the industrial scale tapping of gas resources on the Yamal Peninsula in Northwest Russia, as well as the most important gas transport artery for the delivery of gas to from the Bovanenkovo field to Europe. The annual amount of gas pumped through the pipeline. Some 115 cubic meters is recovered from the field each year, with a prospective output of 140 cubic meters annually. Two tributary lines to the pipeline are to be built before 2015 which will have 55-60 billion cubic meter capacity each. The first line, which is already under construction, is scheduled for launch during the third quarer of 2011. Construction on the second line should being in 2010 and be completed by 2015. In order to deliver gas from the Bovanenkovo field, some 2,500 kilometres of pipeline are required, including the gas transport corridor from the gas field to Ukhta – some 1,100 kilometres. Rotational villages – essentially migrant worker camps – have sprung up as a result of the pipeline construction, where workers from different parts of the country live. They don’t trouble themselves with observing the demands spelled out in the project documentation. As a result, trash and construction waste is piling up, heavy machinery is driven in areas where it is not supposed to be, and departmental monitoring of environmental conditions is either not carried out at all, or is in the best of circumstances, done in a half-baked manner. “These people feel themselves to be transitory in our region, their environmental culture is very low,” Valentin Semyashkin, chairman of the Committee to Save Pechora, a local environmental group, told Bellona Web. He said that daily trash is dumped right outside the rotational villages, that waste from the cafeteria, the laundry, showers and train wagons are taken and poured into the bog source of the Malaya Pera stream, and the Yuzhnaya Nertsa sand pits. Construction waste simply piles up under snow or in the bog, despite the fact that this waste is to be given to special organisations for handling. A deputy from the agricultural settlement Malaya Pera complained to the prosecutors’ office over the actions of Tsentrgastruboprovodstroi, the company building the pipelines. Despite the fact that the construction workers have occupied four sections of the settlement without permission from the settlement administration – the settlement administration has not received any rent payments – the prosecutor decided that as long as state property on the settlement is not demarcated, the lands of the settlement are manages by the regional administration by law. Nina Lesikhina, Bellona Murmansk’s coordinator for energy projects, said such blatant environmental and social disregard is characteristic of Russia oil and gas companies. “This is connected either to the low level of general cultural behaviour of the company managers, or with the absence of an acting system of state controls and punishments for ecological rights violations,” she said. Nevertheless, the result, in light of the total destruction of the environment on the project site ad the death of people because of violations of industrial safety rules, remains as it was. The general tendency of contemporary Russia’s economic development is “anti-ecological” and now “anti-humanitarian” said Lesikhina. a construction electrical engineer with Tsentrgastruboprovodstroi named Sergei Smarygin was no longer able to take the sheer volume of the violations, and decided to blow the whistle. When his numerous reports in which he reminded his managers that expenses for the environment were included in the net cost of the work didn’t help, he went to the prosecutor and asked them to file an injunction against the work of the environmental service of the company, and filed a complaint over the fictitious agreements with organisations to haul away trash. According to Smarygin, instead of construction 2.5 million roubles ($752,000) worth of sanitation facilities for the needs of the rotational village, the company decided it would be more profitable just to dump waste. According to Smarygin’s calculations, each section dumps 570 tons of waste, and smokescreen agreements have been made for its disposal. According to these arrangements, the municipal company Spetsavtodor is supposed to haul off liquid waste. This agreement stipulates that Spetsavtodor is to remove garbage in Sosnogorsk along a seasonal winter ice path Irael-Sosnogorsk – a road that does not exist. “Even if there was a road to Sosnogorsk, taking out liquid and solid waste, would not cost 400,000 roubles ($12,000) but 40 times that,” said Smarygin. In his complaint to the prosecutor, Smarygin said the company, in the absence of any engineering projections for waste, is understating the volume of waste it produces in its reports to the Russian Federal Service for Ecological, Technical and Atomic Supervision, or Rostekhnadzor, which oversees Russian industry and industrial waste. The company has no agreement on water use. The rotational settlements use whatever water comes to hand and no one pays for it – and no one checks its quality. Village deputies from the Committee to Save Pechora, have appealed to Rospotrebnadzor, the Russia government’s consumer rights protection organisation, which drew some small fines against the company, and which had no effect. Rospotrebnadzor refused to comment to Bellona Web about the fines. The construction of a “unique gas transport system of the new generation” leads to medieval methods: workplaces are uncertified, there are problems with the work clothing, and welders are using substandard face shields. The list goes on. 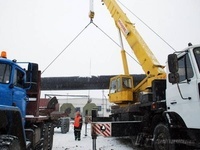 Tsentrgastruboprovodstroi is also using 25-year-old Komatsu-D355C pipe-laying cranes, which didn’t even pass industry standard tests and are forbidden by Rostekhnazdor for use. Many of the cranes are missing safety signals that let those nearby know that the pipe-laying machinery is in use. One such crane killed a worker in October 2008. The official version of the death said that the worker was at fault for not taking into account that the pipe-laying crane did not have a safety signal. For the advancement of the Russian state priority construction effort, the village of Malaya Pera is frequently left without electricity. A high voltage line runs through the territory of the rotational settlement, which is disturbed whenever a pipe-laying crane rolls out. Moving the high voltage line is apparently too expensive, so the booms on the cranes continue to short it out. In November 2008, the offloading of pipes for pipeline construction was taking place from a trailer that was too heavy for the road that it was on. As result, the crane could not bear the weight and collapse with the pipes. The rig workers managed to dodge the fall, and the incident passed without casualties – and the accident once again failed to draw the attention of Rostekhnazdor. For the purposes of minute by minute success, the management is willing to sacrifice human beings, and the accidents go unnoticed by Rostekhnazdor,” said the whistle-blowing engineer Smarygin. The Murmansk Region will soon be the construction site of the Shtokman oil and gas field gas condensate plant in the small village of Teriberka. “It remains only to hope that this village with a 1,418 person population and a unique environment doesn’t turn into a waste and sewage ditch for Gazprom,” said Bellona Mumansk’s Lesikhina. Anna Kireeva wrote and reported from Murmansk. Charles Digges contributed to writing this article.